Office Supplies Talk: Declutter and Save! Today is the last day to take advantage of our Declutter and Save promotion! In it, you’ll find sales, coupons and rebates designed to help you free your work space of extra papers and supplies. 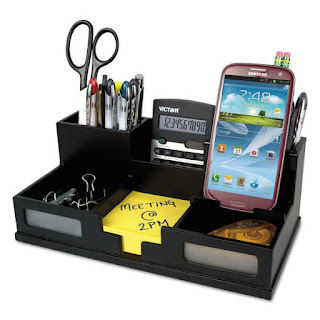 Finding a good desktop organizer is tricky. It’s easy to splurge on the largest unit that has all the space you need, but that can lead to the organizer itself taking too big a footprint. You’re trying to streamline your desk to have as little on it as necessary, and an organizer filled with supplies you don’t use regularly only adds to the clutter. An organizer only needs to have space for what you use all the time, whether pens, note pads, or even a calculator if don’t want it on the desk itself. This Victor model on sale even holds your phone. Plan ahead, think about how many compartments you actually need, and don’t go for file sorters unless you refer to multiple classifications of folders regularly. Your desktop should never be a final destination for papers. 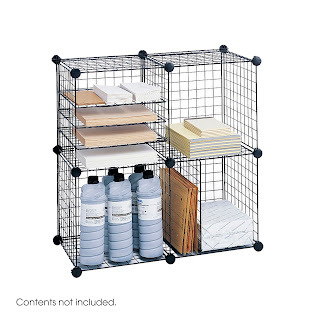 Whether in your office or your home, wire shelving is an easy way to get clutter off floors and desks while still remaining accessible. They’re easy to install, support plenty of weight, and can be used to hold everything from food to cleaning supplies to paper records. We have several shelving options on sale to fit your needs, along with accessories like liners, casters, or posts for expansion. 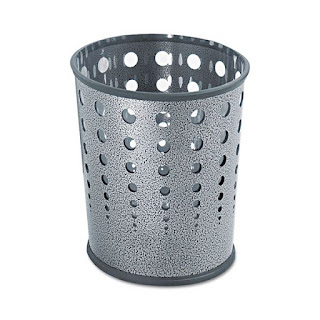 Finally, perhaps the most important tool to decluttering is a well-placed trash can. Make sure you have both a trash can and a recycling bin within reach of any place you do paperwork. Even having to slide your chair or lean over to throw something out adds an obstacle that shouldn’t be there. The easier it becomes to get rid of something, the less likely you’ll leave unnecessary papers around. Once again, the Declutter and Save promotion ends today!